KANSAS CITY, Mo. — When the temperatures drop, many stay indoors, but if you bundle up and head outside, there is a lot to see. "Winter is really one of my favorite seasons because I just love to watch the geese come in," said Brent Frazee, the retired Outdoors Editor for the Kansas City Star. "Nature never sits still, even on the coldest of days," said Bill Graham with the Missouri Department of Conservation. Both Frazee and Graham said winter is a great time to see wildlife and views that we normally don't see. "The thing I love about wintertime, especially going on a hike, it’s so quiet. The woods are totally quiet," Frazee said. "You get out there and the only thing you hear is the crunching of the snow with your boots when you’re walking along. Everything is so stark." "It's one of the best times to go for a walk into the woods," said Graham. "Because with the foliage off you can really see terrain, you can see the shape of trees, how the crown shapes out. This winter the huge icebergs in the Missouri River have become sort of an attraction, with lots of people braving the cold to get selfies when the river is covered and looks more like a slow-moving glacier than a river. One of the most interesting sights is all the winter birds that have come down from the north to winter in KC. "It's been a nature show out there," Frazee said. "It's National Geographic right out here in my backyard. I mean, it has been so inspiring to see all these eagles." This winter, it doesn't take long to spot an eagle in flight or perched in a tree by the river. 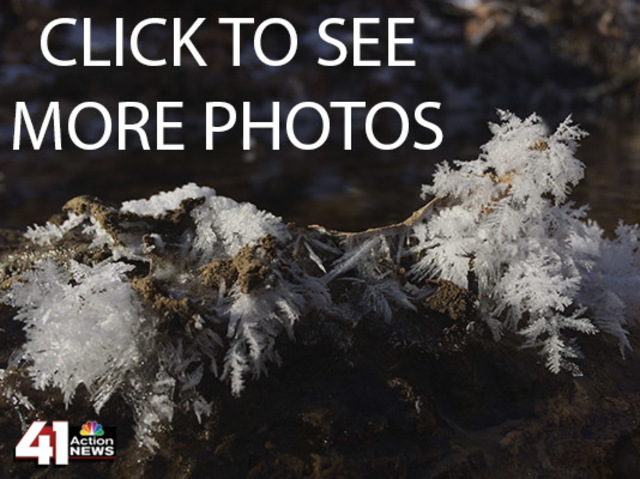 While the temperatures are slowly turning warmer as spring approaches, there will still likely be a few more freezes that might be the perfect chance to get out and see the winter sights before they leave.